← What Do You Remember About Yearbook Day? This entry was posted in Family, Jewish Stuff and tagged bar bat mitzvah, family secrets, Hebrew, Hebrew School, Judaism, love, Parenting, poverty, religion, Spirituality, Torah. Bookmark the permalink. You have some amazing men in your life. Your son’s response really touched me — he gets it! He SO gets it. He’s an old soul. Can you imagine? My father never breathed a word of this until right before Tech’s bar mitzvah? Crazy good secret keeping skills. And THAT is why he worked in the industry that he did for so long. I’d tell you what that is, but then I’d have to kill you. Or maybe someone would come and hunt me down. That is so sweet! It made me cry!!!!! I know, right? There I was interrogating my father and my son reminds me to Honor my Father and Mother. He’s an old soul, that one. TS said it all and your conclusion did, too. Very interesting story. This is a story for TS’s family book some day when you put together the “family” posts in your journal scrapbook. But, at the same time this makes me wonder. If your dad’s story had been well documented, would it have had the impact as you told it? I will go ahead and answer my own question…I don’t think it matters and my guess is the conclusion both ways would be the same. It doesn’t matter. You become a bar or bat mitzvah whether you are on a bimah chanting or on a cruise in the Carribean eating an ice cream cone. It just happens when you become a certain age. It’s just the surprise of it. My parents are notorious secret keepers. As it turned out, this one wasn’t soooo crazy, but it was a surprise. To be fair, I never asked about my father’s bar mitzvah day. I just assumed it was a very modest event. I guess he and my mother had a “Don’t Ask, Don’t Tell” policy at home! A wonderful story, well-told–I love that your father “didn’t want to embarrass his father” and your son’s wise response to the information.Thanks for sharing it with us! Hi Erm. I love how TS understood and respected my father shile i was busy interrogating him. He stopped me in my tracks, reminding me what the bar mitzvah means. I love when my son teaches me stuff. And they have a special connection. TS is fortunate to have great relationships with both his grandfathers. Oh, Tech Support. He’s a fine young man – wise, sensitive, compassionate. You must be so very proud, Renee! I remember being shocked that my mum had been engaged to another man before my dad. What?!?! They’ve been married for 44 years this year – frankly, I think she’d showed marvelous wisdom all those years ago, in choosing a wise, sensitive and compassionate man to share her life with. My brother and I were so very lucky to have been chosen to share that life. When did you learn that? I think these “shockers” become more shocking the longer they are held in. I’m glad your mom picked the right guy! My parents just celebrated anniversary #49. More on that. Wanna guess what day it fell on? Hint: bar mitzvah. So many amazing stories! Hi Annie. Thank you. I suppose it’s a good reminder, too, that people don’t need fancy public affirmations about their faith. If someone feels something in their heart, they just do it. Right? Interesting story. It shows a great sensitivity that your father was willing to forego a bar mitzvah to make sure his father avoided embarrassed.I think your son makes a great point. My father loved his parents and checked in with them every day they were alive. He was a dutiful son, and I know that my Pop really did not have any money. Nothing. I know my father has lived a life that would make any parent proud. How many 13-year olds today would put the dignity of their parents before their own personal desire to have a little fun? Truly, it was a different time. I’m so proud that my son seems to be walking in his Grampy’s path. Niether of my parents had a bar/bat mitzvah at 13 for pretty much the same reasons. Dad chose not to do it at this point, but Mom became a bat mitzvah last year. Your dad definately does not need to have a ceremony now to confirm his faith to G-d or anyone else, but if it is something he wants, I hope everyone in your family will support him and help make it happen! Your dad didn’t have a bar mitzvah either? SHUT UP! Did you know this your whole life? Why did I never know these things? I have known as long as I can remember. I’m guessing the conversation probably came up during my bat mitzvah. A perfect example of how my parents are secret keepers. I can’t believe that I JUST found out! Wow! What a beautiful story. Your son is wise beyond his years! I don’t believe that. I wouldn’t take any credit away from Tech, but I do agree with My Inner Chick that you did a good job, as I’m sure your husband has done also. Hi David! *waves* Oh, I’m taking credit before Hubby. No doubt. 😉 Just kidding. Tech is really a great kid. He just is! I am so lucky. Did I dangle any participles? I found out from my aunt that my very religious grandmother had been married before she married my grandfather, and had given birth to a baby who passed away, and had divorced her first husband because he was a moonshiner. I guess she finally decided that moonshining was a bigger sin than divorce – but I can’t imagine how hard that decision must have been for her (she passed away 11 years ago and she was in her 90s, so we’re talking a whole different world at that time!) She and I never had much of a relationship, and I wish now I had known her better, and seen what a pioneer she was for women’s rights in her own family! Wow! Those are waaaaay bigger revelations than my dad telling me that he’d never had a bar mitzvah. Prior marriage? A baby? A divorce? That was the stuff that Hawthorne wrote about in The Scarlet Letter, for goodness sake! Crazy to think of the complicated lives our family members had long before we entered the picture. Nice to meet you. I DID ask, but no one was answering that question, so I just edited it out! Thank you for being a good reader. And a good writer, too. What a wise young man you’re raising! Love this! Thank you! I am so proud of him? Thanks for visiting me! Lovely and your son’s wisdom and love for his Grandpa are wonderful. Thanks for sharing. Great story. And your dad’s OK about you putting it out on the World Wide Web? I guess so, as you obviously respect and love him a lot. Lovely dad, lovely son. Hi Margaret! Um, I think so. I told him I was going to write about it. I think he assumes everything he says or does is blog-worthy. 😉 He didn’t tell me, not out of shame, but because he was worried that — when I was going through my “Can-we-please-have-a-Christmas-tree” phase — that if I knew he hadn’t had a formal bar mitzvah in shul I would have argued I didn’t want one either. He is a smart man. I would have used that against him in a heartbeat. But I loved going through the process myself and I will always remember it as a very special day in my life. These coming-of-age ceremonies that various cultures and faiths have seem very special. I feel I’ve missed out! No I haven’t. Yup, being a guest sounds good. I’ll see what I can do. I’m totally cracking up at the description of your husband’s bar mitzvah ensemble. heehee. This is very touching, on a multi-generational level. It’s always a treasure when our parents share a previously unknown part of their lives with us. Sometimes I forget that, before I came along, my parents actually had their own lives, their own rich backstories, hopes, dreams, secrets, etc. It’s fascinating to me. I hope you don’t mind that I posted this on your FB page. It seemed appropriate. Feel free to take it down if you feel it is not. You are so right though. My parents continue to have a very rich life filled with love. They are devoted to each other and their family. I just got the pictures today! Squeeee! There are so many amazing photos! How will I ever make an album? We really do live in a time when most people, at least in America, don’t know what it is to be poor. Nowadays parents seem to think it’s better to go into debt to give our kids everything. But it used to be more important to be frugal, practical and honorable. That meant you didn’t buy what you couldn’t afford. As was already said, you are blessed with wonderful men in your family. I think this is why this was so foreign to me. I had always heard stories about how poor my father had been, but to not be able to afford a little party. I had no idea. This explained so much about my father and his work ethic. He taught us to save our pennies, not to live above our means, and never to go into debt. Ever. So proud he’s my dad. What a family you have! A sweet father and a son wise beyond his years. You are all very blessed. I enjoyed this glimpse of your loving family. Thanks so much for sharing it with us. Hi Mary! Thank you so much for your kind words. I do feel blessed to be surrounded by such great family. I am shocked and very diappointed in you that you would blog this. Your father and my parents were (and are) the most honorable and caring people I ever knew. Your Dad and I would not have turned out as good as we did wiithout the values & morals they taught us. And we were not poor.. WE owned a house went to camp…I bought the same clothes as the richest girls. In those days there not too many rich Jews as there are now. They all believed the future was in getting their cjhildern a education. My parents certainly did this. Your Dad got a wonderful education workrd so hard for his family This is the thanks he gets? If that is his darkest secret . I think you did ok. My parents (your grandparents) would not like this. They were very proud & private people. I find this very disrespectful to your Dad. I don”t think I have ever been more angry. Sondra, I can see that you’re upset and you’ve every right to express it, but I would like to gently suggest that Renee’s reason for posting was not to malign or embarrass her beloved dad. Rather, it was to illuminate her son’s innate wisdom – a wisdom, it seems to me, he might have inherited from his grandfather. Renee’s dad may not have been rich, as far as material things go, and clearly there was a time in their (your) family history when times were tight, financially. Perhaps it was for his entire childhood, perhaps only for the year he was 13. It matters not, because what Renee’s dad had was the richness of a relationship with God that went (and goes) beyond ceremony. He has the riches that come with raising a talented and compassionate daughter, the pride of watching her and his grandson cast their own light out into the world. There is no disrespect here. There is, as there apparently has always been, enormous love and pride. This post, in my humble opinon, speaks only to those sentiments. thanks. Liz….itis true that year I had a surgury on my eye that was very expensive. But I had a very normal middle class upbringing and was actually a little spoiled. And Sondra, my father and I discussed this whole thing at length. His “secret” is nothing to be ashamed of. It was just a little something that I didn’t know. And he knew I was writing about this. I love my dad like nobody’s business. I was not trying to embarrass him — or you. I am proud of everything my father has accomplished and continues to accomplish in his life. I know Nan & Pop did everything they could to give their children the best things, but it is also my understanding that times were absolutely tough. You mentioned an expensive eye surgery. I know nothing about this, and I wonder if this post somehow triggered something and made you feel bad. That was not my intention. You said you may have been “a little spoiled.” Maybe you got special treatment because you were a girl. Nanny always talked about “the blue coat” story, and I know she wanted you to have fine things. You are right when you say Nan & Pop valued education, but I also know my dad had to work hard to make darn sure he was going to get a scholarship — or there might not have been college. Learning that my dad didn’t have a formal bar mitzvah clarified so many things for me. He has always been a pragmatic person with simple needs. He does not crave expensive toys, and he is very content with what he has. I’m sorry if I hurt you. My intention was quite the opposite. 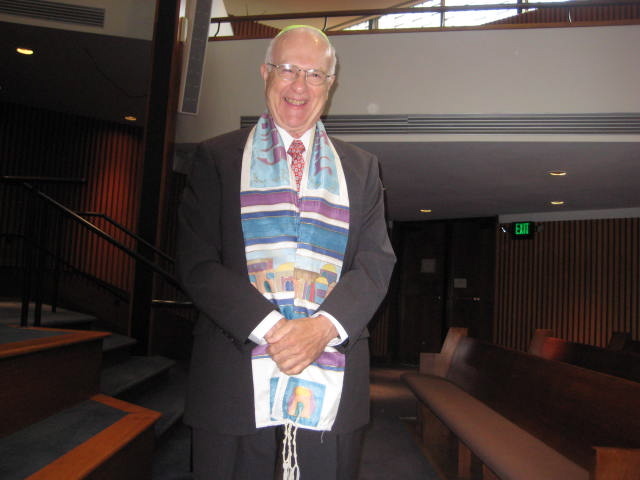 I was trying to hold my father up as an example and show he became a bar mitzvah in the most true sense of the word. He didn’t need a fancy party. He understood the situation and accepted it. That is something a man does. As I said earlier: How many 13-year olds today would put the dignity of their parents before their own personal desire to have a little fun? Truly, it was a different time. I’m so proud that my son seems to be walking in his grandfather’s path. LOVE! You capture the essence of your dad speaking so well..it’s like I can actually hear him. Tech Support’s got it right on this one!!! Your dad is a good man! XO! Your son is a wonderful young man and very bright. I just felt bad because I knew what a wonderful Dad you have. When I get mad, I have a very bad temper. Gee. I wonder where you got that. Nan or Pop? 😉 Thank you listening. Do you want me to delete our conversation? Or leave it? wonderful post – you son sounds so wise and compassionate – could it have anything to do with his upbringing? Thank you. You are kind. I appreciate your words. Thank you. His dad and I are constantly amazed by him. You can leave it. When I reread it, I think I missed my main point……which is….If your Dad was bothered by that enough to not to say amything for 60 years then you shouldn”t blog it. Sorry if I over-reacted. Ahhh! I understand! That would have been awful! If someone tells me something in confidence, it is NOT for the blog. But Dad seemed just fine with things. In fact, I suggested — maybe — he might want to have a bar mitzvah now! That we could all come to hear HIM chant, and have a party for him as his 75th birthday is approaching. He was underwhelmed and said he didn’t feel like he had anything to prove. Does that sound familiar? 😉 Lots of love to you, Aunt Sondra. This is like watching a family dinner, from afar. Love it. Your father is adorable – I see where you get it from! And he sounds like a wonderful man; Tech Support is certainly following in his footsteps! Wow. I’m surprised by my 8-year-old nephew’s wisdom all the time. Like the time he told me my hair looked good. Hi Jules: Why are you surprised by your nephew? You do have amazing hair. And it smells terrific. Mmmm. Like computer screen. ‘Tswhat I’m sayin… It’s not about reading from the Torah, it’s about learning what’s in it! I see a little carryover from our convo on the bnei mitzvah gifts post, no? That a bar mitzvah is something you *become* no matter what. This is going on my Facebook wall. The bar mitzvah rite and message has gotten so confused. Ruchi! I swear you came into my life at the right time for a purpose! I’ve been meaning to find you! Can you believe? You were so very right! And now I understand and feel even more proud. It does seem obvious. So many people see their bar and bat mitzvah days as an endpoint, but my father has never stopped learning and living the words of the Torah. I’m so proud of him. And yes, the message has gotten so confused! I’m thrilled that my son enjoys going to shul. Even though we changed to a reform temple, he is never seen without his kippah: the rabbi noted this on the bimah. My son feels it is a sign of respect and feels “weird” entering the building without one. So proud of him as he follows in my father’s footsteps. Thank you for teaching me. This is a wake up call. I need to take a class with Rishi Hein from our local Chabad. It’s time to learn more. Please do!! I have the chills thinking about this. There is a Jewish teaching that when God has to put a diffuculty into the world, He first creates the seeds of its repair. Sometimes, we are fortunate to see this at work. Give your Jewish dad and wise son a special hug. Maybe when he’s not expecting it, run up and carry him around on a chair. Everyone loves that. So funny you mentioned that! I have a post on the hora coming up. Tears in my eyes from the MOMENT in a lifetime of this post. It is a beautiful moment where nothing else around you mattered. I loved it. Thank you for your words. Thanks Alex. I knew you’d get this. Meanwhile, you’re post about your Nona had me in tears. I was positively riveted! You inspire me every day. Thanks Clay. I think if you have secrets, it is really a good idea to get them out in the open. I think they become a bigger deal the longer people hold onto them. I know so many people who have revealed what they thought were horrible secrets, only to realize their families were forgiving and filled with love. Unless, of course, the secret is a train wreck in which case you’d do better to take it to the grave. Honestly, I know adults who have had children with different partners. Out of wedlock. Folks who gave babies up for adoption…and in every case it has been better received when people revealed the secret before it was brought to light by someone else. I’m glad my dad told me so I had a chance to ask questions. Wow, Renee, what a moving story. Actually, neither of my parents had a bar/bat mitzvah as children although they were both born to two Jewish parents and both families had memberships to synagogues. There’s a lot more to the story, but here’s the end: They had a joint one by choice a few years ago after spending two years in an adult bnai mitzvah class. I planned their party, made them a video, etc. But I don’t want to plan another party. Like ever. I love the respect your dad showed your grandfather.